30 Day Blog Challenge Day 13 | What's In My Fridge? Before I start this post I have to apologise, I don't feel as if my last few posts have been great. I'm not very well at the moment so am finding it a bit of a struggle, I will continue though. As it's shopping day today, my fridge isn't anywhere near as full as it usually is, in fact the vegetable drawers are looking rather sad. I do have a few things to share with you though. I share my fridge with other people, so not everything you see is mine, but I will only mention the things that are. The first thing you probably see is a big jug of water, I don't remember what model it is, but it's a Brita water filter jug. I very rarely drink anything besides water. Not because I don't like anything else, mainly because I would rather save my calories for food. I like the tap water where I live, but I still find it a lot nicer once it's been filtered. You may also be able to see a pink sports drink bottle on the right hand side and a blue one in the door, these are also water. I have a few of these bottles and always have some ready to go so I don't have to cave and buy sugar filled drinks when I'm out. I love Chili Heatwave Dorito's with the 2 dips at the back, the red jar is hot and the green below it is cool. I am terrible at making decisions, even ones as daft as what dip to have, so I usually have 3 on the go at once. The smooth is in the cupboard. The green tin in front of the dips is a tin of dog food. Benevo is a vegan dog food that Cherry loves. I mix it with her dry food and she seems to be thriving on it. Before switching her to a vegan diet she had food intolerance's, red sensitive skin and was always scratching, but now she seems to be over all of that. The tall green box peeking out from behind the water jug is Jus Rol puff pastry. I was really surprised to hear that this is vegan, it's really nice and so easy to make lovely things with. 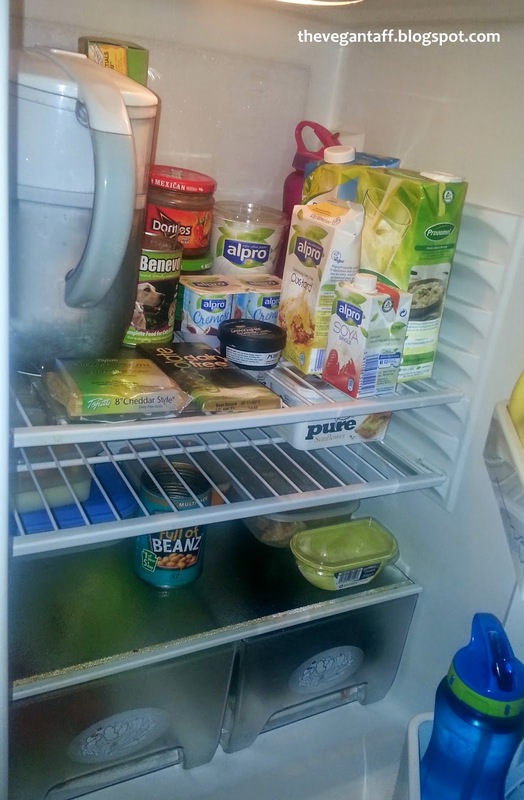 To the right of the dips is a big tub of Alpro plain yogurt. I don't like plain yogurt on it's own, but for cooking this is great. I usually make a mushroom stroganoff with it but I'll be using this to bake this weekend. If you need to bake minus eggs, use 1/4 cup of plain yogurt for every egg the recipe calls for and it works just as well. In front of that I have 2 pots of Alpro cherry yogurts. This is the first time I have tried these particular ones and they're up there with the best. They are thick and creamy and perfectly sweet. For anyone trying to cut dairy out of their diet I would really recommend these, I know it's been years since I've tried the dairy offerings, but to me they don't taste any different. The tall blue box hiding on the far right (not in a racist way) is Rice Dream, a brand of rice milk. I use this on my cereal and in baking recipes. Rice milk is quite sweet so I wouldn't suggest cooking with it, but for hot drinks, cereal and baking it's perfect. At the side of that is a carton of Provamel vanilla drink, a soy based milk that I drink on it's own and use in recipes. This makes the perfect pancake along with vanilla extract and maple syrup. In front of the milk is Alpro vanilla custard, yum! If, like me, you love tins of Devon custard you will also love this. I can happily eat this cold, on it's own, or heated up on puddings. I usually have a carton of this hanging around just in case. The small carton at the front is Alpro single soy cream. Even when I ate dairy I was never a fan of cream, unless it was the processed stuff in a squirty can. I use this in cooking and it works great, adding richness without being too fatty. The small black tub is a Lush face mask, it's called Catastrophe Cosmetic and is fresh so has to be kept in the fridge. I have fallen in love with this mask, while I had a rather nasty breakout I bought this and used it in the evening, the following morning I awoke to smooth clear skin, I couldn't believe it! As the Lush masks don't contain any preservatives they have a pretty short shelf life, they recommend that you use it up within 3 weeks, but I have had this for double that time and it's still fine. You can freeze it if you're concerned though. It's difficult to see, but next to the face mask is a bar of Plamil mint chocolate. As I've previously mentioned, I haven't yet found a vegan chocolate that I love, but this is adequate. It's quite creamy and melts nicely. Next to that is a pack of Toffuti cheese slices. I bought these to go on burgers, so am not getting through them very quickly as I try not to eat burgers too often. They're ok, the taste isn't very strong and they don't melt, but that's not what they're designed to do anyway. I think I'll have the rest in a salad sarnie, they'll probably fare better cold. On the next shelf down I have a couple of tubs of Pure vegetable spread. It's the only margarine I buy and got 4 when they were on offer in Sainsbury a couple of weeks ago. I use this for everything, toast, sarnies, cooking you name it. It's the only one I've tried that I like on toast without anything else. 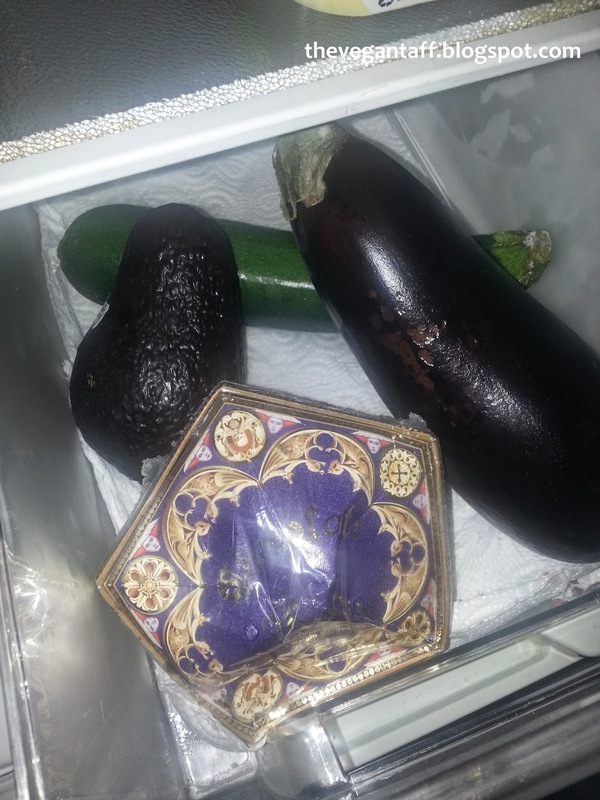 In the first vegetable drawer I only have 4 things, an avocado, an aubergine and a courgette. One of my favourite things also lives in here, a chocolate frog my Mum bought me when she went to Disneyland Florida. I am a bit of a Harry Potter geek and have a few little bits like this. It's still in the wrapping and has never been, and never will be, opened. Unfortunately it's a bit squashed on one side, but I love it all the same. 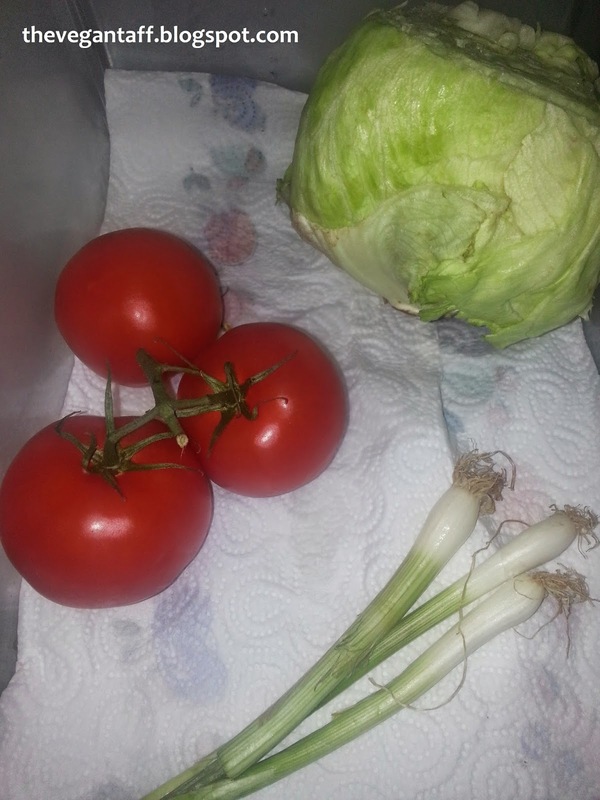 The second drawer is pretty sparse too, only containing an iceberg lettuce, 3 tomatoes and 3 spring onions. I love spring onions so almost always have some in here. As you can see I have put some kitchen roll in here as the lettuce was wet and I didn't want to get mould. I also keep a couple of cake toppers in Tupperware containers in my fridge. 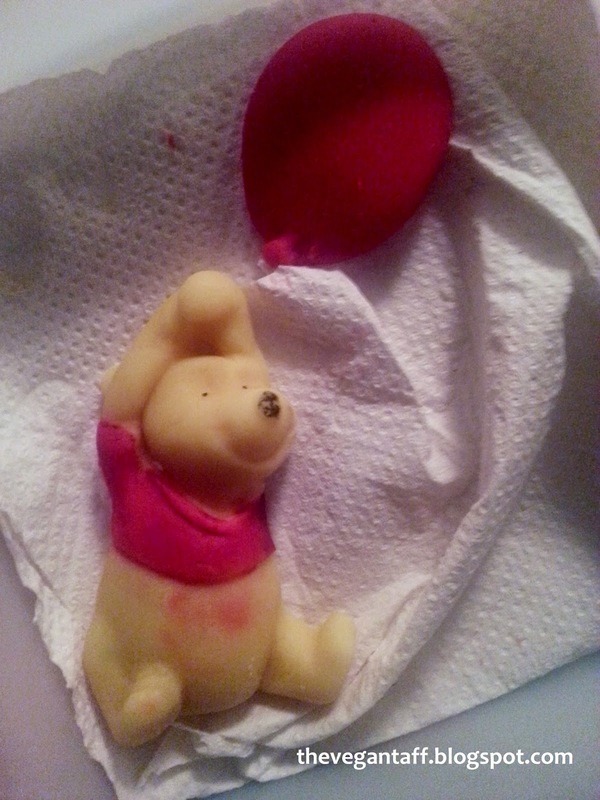 This Winnie the Pooh is off one of my 21st birthday cakes. He's looking a little worse for wear now, but I don't think I'll ever get rid of him. 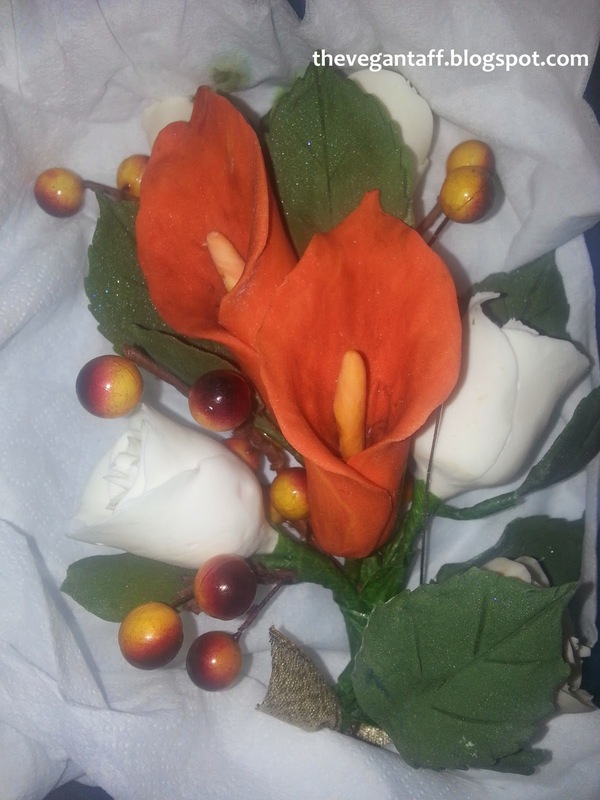 The last thing I have to show you is one of the toppers from my Dad's wedding cake. He and my Step-Mum got married almost 5 years ago, and knowing that I like to keep sugar toppers from important celebrations, she gave me this to go with my collection. It's still perfect and shows no sign of ageing, thankfully. I honestly thought I had more of these sugar toppers in the fridge, they must be in my mini-fridge instead. Well, that was more than I thought. I'm kind of glad that I haven't already been shopping when I post this, I'd keep you here all day if it was full of fruit and veg. If you're doing this, or any other, blog challenge please leave me a link below so I can read it.